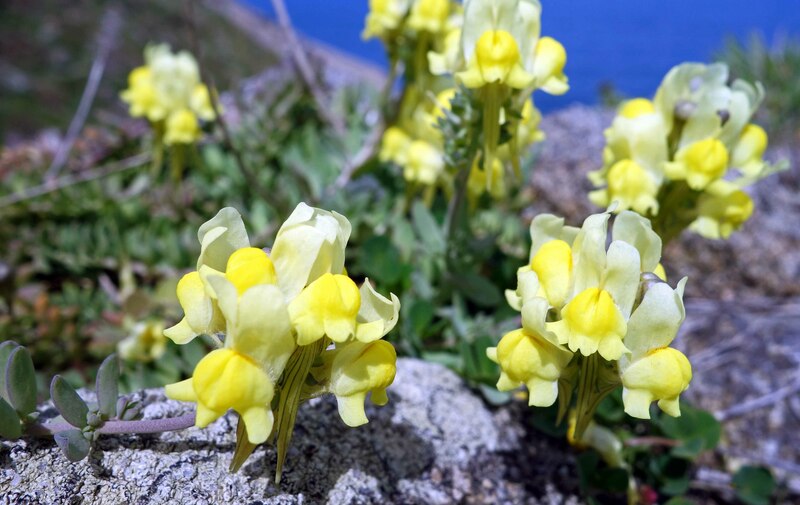 This beautiful little flower is found along the coastline of northern Spain. It is often associated with dune systems (1) but also occurs on headlands, rocky areas and outcrops. These photographs were taken in late April at Punta de Estaca de Bares (Cape Bares), which is the northernmost point of the Iberian Peninsula. 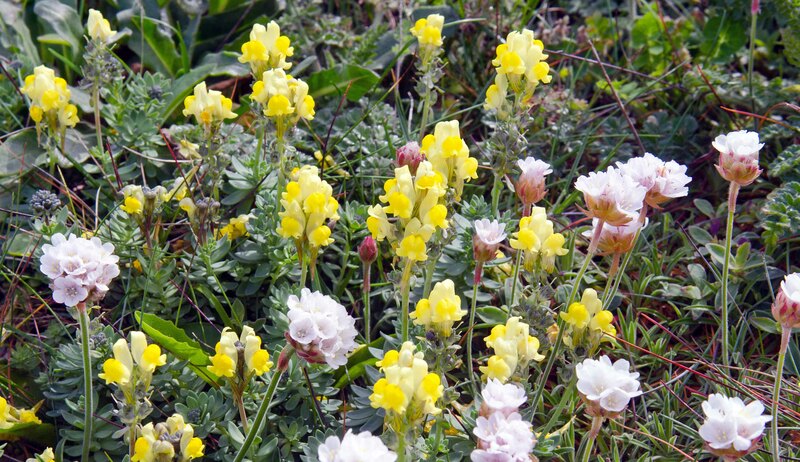 The Prostrate linaria, Linaria supina subsp. 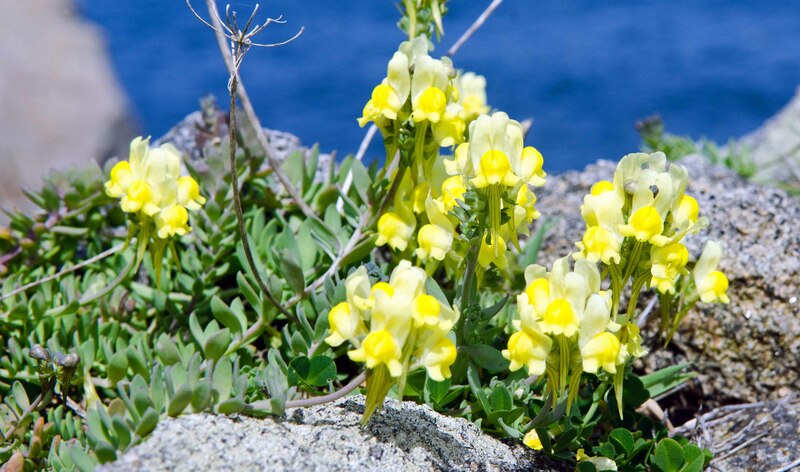 maritima also known as Linaria maritima is a common and abundant plant along the coasts of northern Spain and looks very attractive, nestling on the ground amongst the sea pink flowers (below). 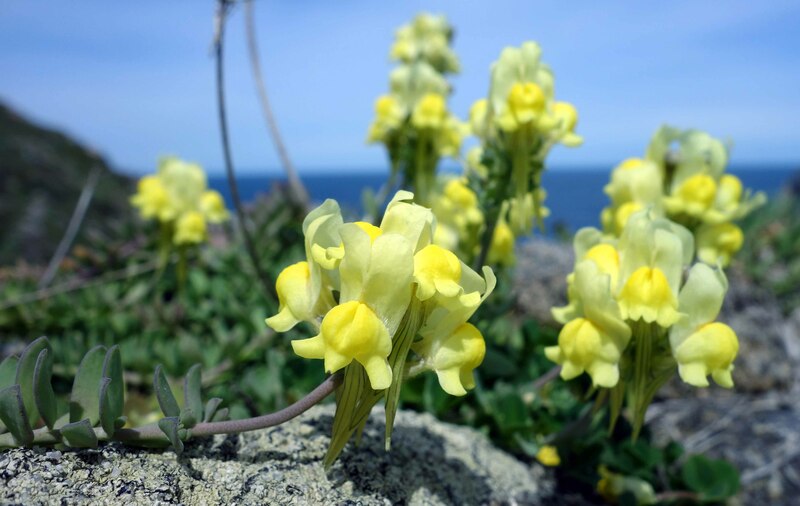 This lovely species, which is related to common toadflax, has a very characteristic feature which distinguishes it from the latter: a decumbent posture! Decumbent means trailing along the ground (i.e. procumbent) but with the apex of the shoot turning upwards! Prostrate is another word for the same appearance. It looks to me like someone lying on their side with their elbow on the ground! As is often the case when you take a picture of a flower, and then look at the image more closely on the computer screen, an insect appears that you failed to notice in the field! In this case is was a small, grey, weevil-like beetle, head down in one of the linaria flowers. After a little Googling, I came to the conclusion that is must be Rhinusa antirrhini, the Toadflax seed-feeding weevil. After all, what else would it be doing there?! Rhinusa antirrhini (Curculionidae), is ‘a species of weevil broadly distributed across Europe that both feeds on, and oviposits and develops within, species of the plant genus Linaria’ (2). 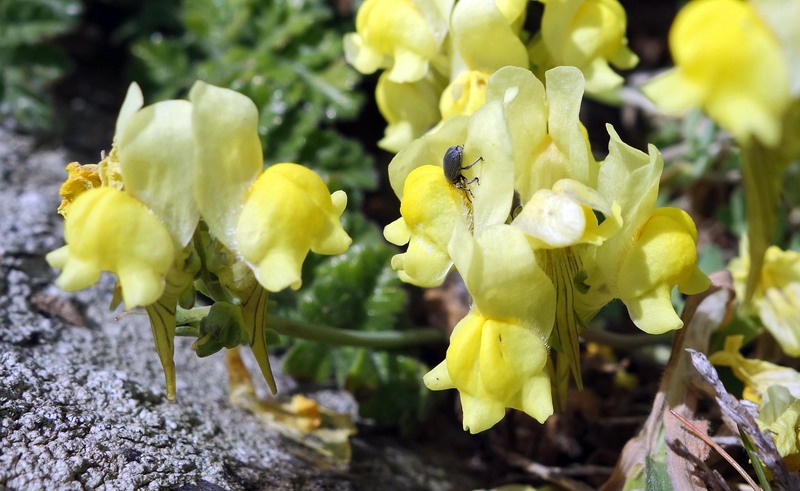 It turns out that some Linaria species are invasive plants in the USA and Canada, and this little beetle is being pressed into service as a biological control agent (3). 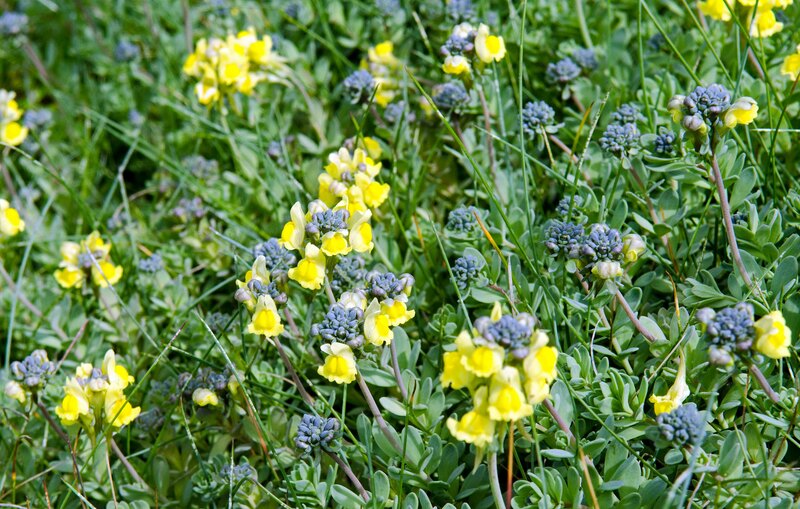 Some of the clumps of flowers were only just opening in late April, and had a very striking appearance, bunched-up, green and rubber-like before they became the yellow flowers (below). 2. HERNÁNDEZ‐VERA, G. E. R. A. R. D. O., et al. “Host‐associated genetic differentiation in a seed parasitic weevil Rhinusa antirrhini (Coleoptera: Curculionidae) revealed by mitochondrial and nuclear sequence data.”Molecular Ecology 19.11 (2010): 2286-2300.